Highly Likely to Recommend -Michael was a home run for us. This is the 6th home that I have purchased and Michael made it the best experience yet. His negotiation skills are professional but stern. His knowledge of the local market was exceptional. The technology aspect was eyeopening. Sighing documents while having dinner and using our smart phones was such a time saver. Hire Michael now. You will be glad you did. Michael was Absolutely Fabulous to Work With! -Michael was absolutely fabulous to work with! As first time home buyers, my fiance and I were not familiar with how complicated the process could be, but Michael made the whole process incredibly smooth. He kept us informed, so we always knew what to expect ahead of time. He was always there to answer our questions, and is extremely responsive via e-mail, text, and phone calls. My fiance and I have busy schedules and limited time, but Michael was always able to accommodate our schedules and often with short notice. Michael also has a wonderful team of inspectors, and made sure that we were well aware of any problems uncovered during the inspection process. I will highly recommend Michael to my friends and family, and will definitely be working with him again in the future. First Time Home Owner -As a first time home owner I couldn't be any happier with the service that Michael provided . I was honestly intimidated by this whole process but his guidance and flexibility with my schedule made all the difference. If you are a first time home owner and have MANY MANY QUESTIONS , Michael is the go to person , he has answers , and he will recommend people that he trusts to help you along the way. Thanks again Michael! Michael Was Hands Down the Best Part of our Buying Process. -Michael was hands down the best part of our buying process. He came highly referred from a friend so we gave him a chance. My wife and I have pretty complicated schedules but Michael always seemed to find time mixed inside of our hectic schedules. He was very responsive via email, text, and phone calls. Our funding team were making things confusing, but Michael communicated with them to help us understand what was happening. 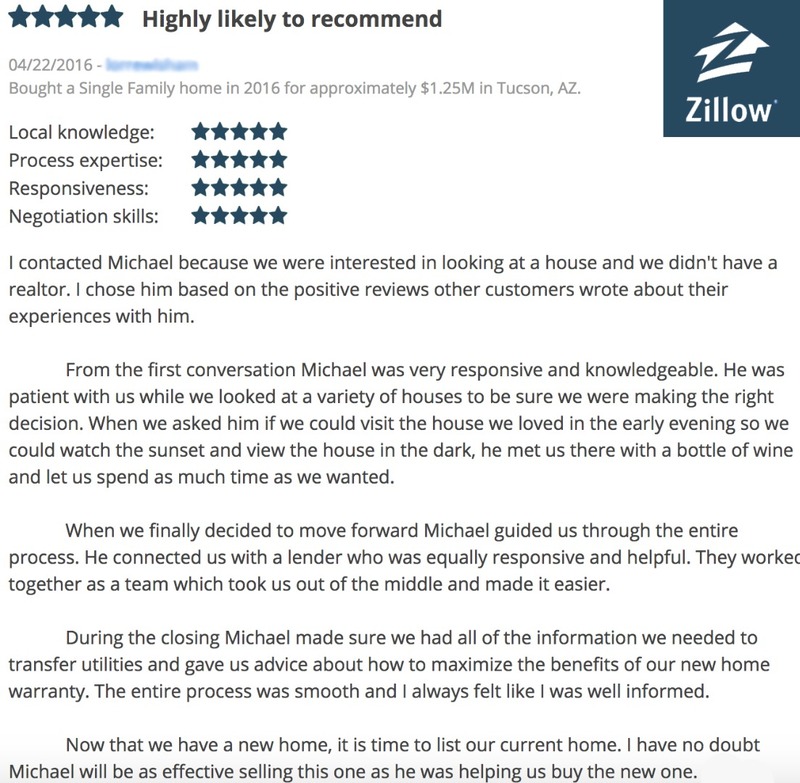 As first time home buyers, we felt much more comfortable with Michael on our side. He was present with us from the open houses, to the home inspections, and even for the final signing. I definitely recommend that you use Michael. I'm not the easiest person to please when it comes to business deals , but his service was worth more than the commission he received. Michael Sold Our Home Michael sold our home in only two months with 26 comps in a 1 mile radius! He had a strategy for pricing and marketing and was able to get us a higher price than our low end. Michael worked in a consultative role for us, was never pushy, and walked us through the entire process. He kept us informed every step of the way with state of the art communication as well as in person and phone conversations as needed. 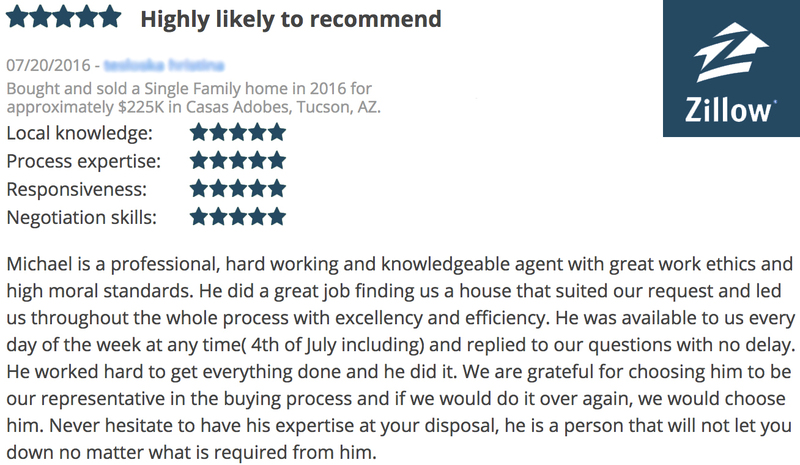 We would highly recommend Michael and believe he is one of the top young professional realtors in the Tucson community. Thank you Michael!